The universe is about to end. For the many different alien races, the Grail is the one thing that promises life and safety. For some, the Grail is a spaceship. For others, it’s a new planet. You have been tasked to search the stars and find the Grail before others claim it. Risk everything and take no prisoners to save your species from certain annihilation. 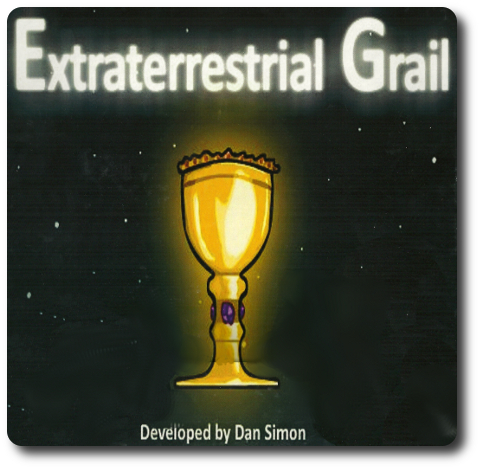 Extraterrestrial Grail, designed by Dan Simon (II) and published via the Game Crafter, is comprised of 1 game board, 8 Alien cards, 28 Instruction cards, 48 Attribute cards, 8 Planet boxes (holds cards), 8 Spaceship tokens, 4 standard six-sided dice, 1 digital timer, 1 notepad, and 1 pencil. The illustrations for the game are not what I would consider “professional”, but are certainly better than I could draw. The tokens are plastic miniatures of different types that represent assorted spaceships. The digital timer is just what you would expect and is commonly found in kitchens. The cards are standard size and are as durable as your standard playing card. Second, shuffle the Instruction cards and place the deck face-down on the designated spot found on the game board. Third, shuffle and deal 1 Alien card face-up to each player. Place the remaining Alien cards back in the game box. 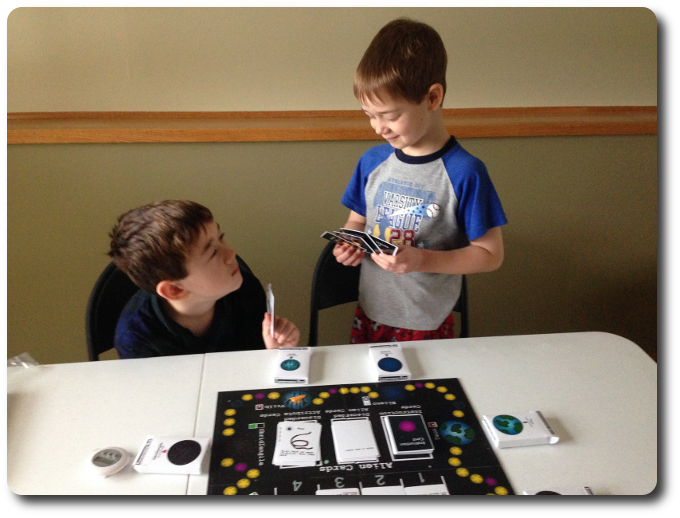 Fourth, have each player select a Spaceship token and place it on their Alien’s Home Planet. The Alien card will determine the Spaceship token color and Home Planet. Fifth, assign one player to keep track of each player’s Alien life points (health). Give this individual the notepad and pencil. Record each Alien’s starting health on the notepad. Sixth, shuffle the Attribute cards and deal a specific number to each player, face-down. The number of Attribute cards dealt is dependent on the number of players in the game. Players should look at their Attribute cards, but keep them hidden from their opponents. When viewing the cards, players should consider which 6 to keep for their starting hand. Seventh, have each player roll 2 six-sided dice to determine who goes first to choose planets. The player with the highest rolled value goes first with turn order sequence continuing in clockwise order around the table. Starting with the first player to choose a planet, any number of Attribute cards are placed on the Planet space on the game board, face-down. This is repeated, one free planet at a time, until all the planets have Attribute cards or all the players have no less and no more than 6 Attribute cards in their hand. Place the cards in the Planet boxes for safe keeping. Eighth, from the remaining 6 Attribute cards the players have in their hand, any that have the “eye” symbol are placed, face-up, in front of the player for everyone to see. The remaining cards should be kept hidden from the player’s opponents. Ninth, have each player roll 2 six-sided dice again. This role determines who goes first in the game. The player with the highest rolled value goes first with turn order sequence continuing in clockwise order around the table. Place the Alien cards in the order of play to assist in keeping track of turn order sequence. A spot is reserved for this on the game board. Tenth, get ready to play and make sure everything is set up correctly on the game board. When everyone agrees that the game is ready to begin, set the digital timer for 25 minutes if playing with 2 players or 30 minutes if playing with 3 to 4 players. Start the timer and begin. There are three different cards in Extraterrestrial Grail. How they are used and when are summarized here. Each player is given an Alien card at the start of the game. This Alien card represents the race that player will be looking after as they search the stars for the Grail. A lot of information is included on the Alien card that will be used later in the game. This is especially true when the player attempts to search a “Planet” space or enters combat. Attribute cards help the player make up for any Alien shortcomings they might have, improve their odds of survival, and make plans on how best to eradicate their enemies. A player is limited to 6 Attribute cards in their hand and some Attribute cards have an “eye” symbol on them that indicates they must be played face-up in front of the player. Attribute cards played out in front of the player still count towards the player’s hand size maximum of 6 Attribute cards. Some Attribute cards can be used multiple times while others are limited. Some Attribute cards can be used in combat and reduce an opponent’s health. In contrast, some Attribute cards can be used to gain health. And not all number values are necessarily locked. Some Attribute cards provides bonuses and penalties depending on what number is rolled on the die. 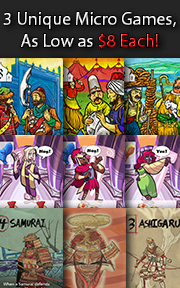 A complete description of each Attribute card is provided in the game’s rule book. Instruction cards are used to determine the result of a player recklessly jumping into “Nebula” space. While not always bad, the results are not always good, either. Players could gain an additional turn and life. Players are just as likely to lose a turn and a much-needed Attribute card. Then there is the random element of surprise that the universe likes to throw the players. It’s very possible that a player might stumble upon an unstable wormhole and be sent to the opposite side of the universe. Which, honestly, might or might not be such a bad thing. Long story short, enter a “Nebula” space at your own risk. The Instruction cards do not have any illustrations (they are only text). As such, no visual examples are provided. Extraterrestrial Grail is played in rounds and turns. This is a real-time game and players are expected to complete their turns as quickly as possible. If a player appears to be stalling or cannot make up their mind, the game rules instruct the players to skip that individual’s turn. I’ll leave it up to you to determine if that is a good idea or not. What I do strongly suggest is that the first round of game play NOT be timed. This gives new players the ability to take in what is being done, why, and what is possible on their turn without feeling pushed by the timer. After the first round of game play, start the timer. Adjust the remaining time as necessary and if required. The “Grail” Attribute card is either in a player’s hand or on a planet. The timer is counting down, signifying the end of the universe. The Grail is the only thing that can save the player’s race from the quickly approaching doom. As such, searching for and obtaining the Grail is the primary focus of every player. But there is more to find and acquire than just the Grail in this game. Helpful equipment can also be found and will assist the player in their search. Some planets are not very hospitable, for example, and a player will need the right equipment to land and explore its surface. Players are given several action options on their turn. 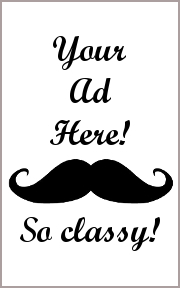 Each of the options are summarized here. A player is not required to move, but if they want to, they should do it first. In order to travel to another planet location, the player rolls a single six-sided die. The player then looks at their Alien’s intelligence level which will modify the rolled value. Stupid aliens reduce the rolled value by -1, normal intelligence (whatever that might be) leaves the roll as it is, and smart aliens add a +1 to their rolled value. It’s possible that a player will not be able to move at all or be able to move up to 7 spaces, depending on their dice roll and Alien’s intelligence. Note that there are some very smart and some very dumb aliens out there, and yet they have all learned how to travel between starts in the blink of an eye. Hmm…. Each “Star”, “Nebula”, “Portal”, and “Planet” is considered 1 space. Players may choose to land on a planet to explore it or move by. Players may also choose to land on the same space as an opponent’s Alien to begin combat or move on by. Landing on a “Nebula” allows the player to draw 1 Instruction card and landing on a “Portal” allows the player to move wherever they like regardless of distance and movement left. Attribute cards can be used, but only once if the player is not locked in battle. Landing on the player’s “Home Planet” will increase the player’s Alien’s health by +1, but only if they have less than their maximum health. If the player’s Alien is unlucky enough to perish on another planet or while traveling through space without entering combat, all the player’s Attribute cards are placed by the nearest Planet space for others to loot through. Can the alien breathe the planet’s atmosphere? Aliens can always breathe their “Home World’s” atmosphere without issue. The same cannot be said for other planets in the solar system. Some Alien species have an easier time adapting to different environments while others are forced to wear breathing gear. Regardless, a player can always land and jump out of their spaceship. If they don’t have the right gear, however, the Alien will lose 1 health due to the environment being too hostile. Can the alien sustain their body temperature? Again, the player must determine if the environment of the planet they are landing on is hostile to their Alien or not. If the player’s Alien doesn’t have the right equipment or is adaptable enough, they will lose 1 health. Moderate temperature environment cause no damage to any alien species. Can the alien see on the planet? Not every planet is close to the sun and not every planet has the same amount of ambient light. While darkness won’t cause health problems, it will make it impossible to search the planet for the Grail. Equipping aliens with lights or some other illuminating source will counter the effects of the darkness. Can the alien travel without issue? This is more about the planet’s terrain and not the alien’s ability to zip from one star to the next. If the planet is mountainous, for example, a player’s Alien needs to have rope to help scale the craggy cliffs to explore every nook and cranny for the Grail. As you can see, exploring planets is much more than just dropping off a few aliens, picking up lunch, and returning before it gets dark. Planning is necessary to ensure the search party stays alive and has what they need to do their job. Even after all that, actually exploring the planet is pretty dangerous. Players pick up the Attribute cards found on the “Planet” location and look through them. Any “Booby Trap”, “Nitrous Oxide Canisters”, and “Eboolian Virus” Attribute cards are announced and resolved. After being resolved, they are discarded. Then the player can look through the rest of the cards and swap out any they have in their hand with the cards on the planet. When done, the player cannot have any more than 6 cards in total in their hand. The player now owns (controls) that planet. When a battle starts, both players roll a six-sided die with the player who rolled highest going first. Players can then decide if they want to use a “Natural Attack”, which reduces their opponent’s health on a roll of 4, 5, or 6. Or, the player can decide to use an Attribute card. The player also has the option to run and escape from the battle, successfully doing so on a roll of 5 or 6. Only one option can be taken each “Battle Turn”, with each player given 1 choice out of 3 each time it’s their turn to decide what they want to do in battle. It’s important to note that battles take place in real-time. While two players engage in combat, the rest of the players can only wait while the timer continues to tick down to zero. Battles continue until one alien dies or one alien successfully runs away. If an alien perishes, the victor gets to look through their vanquished opponent’s Attribute cards, keep what they want (not going over 6 cards in their hand) and dropping the rest off on the nearest planet for later looting. If an Alien perishes (runs out of health), the player is out for the duration of the game. The game continues with each player taking turns and attempting to find the Grail. When the digital timer indicates that all the time has run out, the game immediately ends. The player who has the Grail card in their hand is the winner. If no one has the Grail, then no one wins the game. If only 1 player is left and there is time on the digital timer, they do not win by default. They must still find the Grail before the game ends. If the only player with a living Alien finds the Grail before the timer beeps, the game ends. To learn more about Extraterrestrial Grail, visit the game’s web page. For the most part, the Child Geeks enjoyed Extraterrestrial Grail. They were not fans of the digital timer about halfway through game and were very upset when they were told they had to sit the rest of the game out while their friends and family played without them. They also became upset when they thought opponents were taking up too much time on their turn. This was especially true for combat. The older Child Geeks understood the dangers of the exploring the planets well enough and did a great job of attempting to find the Grail. A few of the Child Geeks did a so-so job of keeping the Grail hidden when they found it, while most got too excited and became target. One Child Geek was so excited that he jumped up and down and showed everyone the Grail. His Alien died quickly thereafter. One Child Geek said, “I like how you have to explore the different planets to find the Grail, but I don’t like that I have to roll to get there. Can’t I just jump to the planet?” Another Child Geek said, “I don’t like the timer. It makes me feel stressed. I would rather just play the game instead of worrying about how much time I have left.” Not all the Child Geeks thought so, however. One Child Geek said, “What makes this game great is that you can see how little time you have left to explore and find the Grail. Makes things exciting!” When all the games were over, the Child Geeks were mixed about their feeling towards Extraterrestrial Grail. Some found it fun, while others found the entire experience to be rushed. An older brother tries hard to “read” his younger brothers face. Does he have the Grail? Yes, he does. The Parent Geeks didn’t seem to mind the digital timer, but didn’t care much for the Attribute cards. One Parent Geek said, “I’m having a hard time understanding what these cards do or why I would want them in my hand.” Another Parent Geek said, “This game has some great ideas but is lacking a lot of component detail to help players play the game.” As far as the games went, each Parent Geek demonstrated complete understanding of how important it was to find the Grail and smash anyone who they thought had it. One game was nothing more than battle after battle. Only after all but one player was left were the planets explored. In a strange twist of justice, the surviving player ended up dying on a planet he was exploring because (and I quote) “he was sure the Grail was there”. No, it wasn’t, but his alien’s corpse sure is. When all the games were over, the Parent Geeks couldn’t decide if they liked the game or not. None of them “loved it”, which is to say, none of the Parent Geeks felt required to jump to the game’s defense when others had negative comments. In the end, the Parent Geeks all agreed that the game had some good ideas that made it worthwhile, but the game itself needed more work before it would be played again. The Gamer Geeks hated the game right from the start. One Gamer Geek said, “Wait. Is this a roll-and-move game? Are we playing Space Candy Land here?” A number of the Gamer Geeks had a hard time looking past the components, let alone the game play. One Gamer Geek said, “I know it can be hard to make a game, but I’m really disappointed in some of this artwork or lack thereof. I don’t feel connected to this game’s plot or narrative whatsoever. How much time do we have left on the timer?” Nor did the Gamer Geeks like the battles. The use of Attribute cards helped, but the battles took too long and were too random. In short, they ate up game playing time without benefiting the game. They did find a strange sense of sick pleasure in knocking a player out for the duration of the game early on, but most of the time, the player who got to leave the game was happy about it. All the Gamer Geeks liked how each planet was different and required players to “equip” their aliens to explore the planet. According to one Gamer Geek, “This is the only aspect of the game I like.” Another aspect all the Gamer Geeks liked is that they knew that someone had the Grail right from the start. The hunt for the Grail turned the game into a bloodbath, however, instead of a search for salvation. When the last light of the universe went out, all the Gamer Geeks breathed a sigh of relief, happy in the knowledge that they would not be asked to play Extraterrestrial Grail again. I really enjoyed that each planet was not just another stop on the game board. There was no telling what treasures or dangers could be found until you landed and explored. Of course, the player who initially seeded the planet with Attribute cards knows full well what might be there, but most of the players are hoping to find the Grail. I also really liked how players had to prepare not only for the worst, but also equip their search teams to improve their success. Losing health is not a good idea in this game, as other opponents will pounce on you if you are weak. This makes each planet landing something to consider, plan, and calculate to determine if the risk can be mitigated, let alone worth the landing. Another aspect of the game that I found interesting is the ability for players to hunt down other aliens and take them out. This serves 2 purposes. The first is to eliminate the competition. With fewer aliens searching for the Grail, the odds are much better that the player will find what they are looking for. Reduction in number in players also provides more turns and less downtime between them. The second is the ability to hasten the game’s ending. If a player has the Grail, they can move the game to a successful conclusion if they defeat all their opponents. This is fairly gutsy, as entering battle could lead to a player’s untimely demise. I don’t care for combat taking place in real-time, however. Battles tend to take too long, despite each Battle Turn being quickly resolved. Finally, it was very interesting knowing up front that someone had the Grail or knew exactly where the Grail was hidden. It wasn’t something to be found, but encountered. Each death of an alien or a swapping of cards made everyone lean forward and take note. You have to have a really good Poker face in this game if you have the Grail, do whatever it takes to make it look like you are still searching, and stay the heck away from aggressive opponents. Without fail, any players that even hinted they had the Grail became Public Enemy Number One and quickly perished under a barrage of laser fire. It was hilarious when they didn’t have the Grail. Well, not everyone found it funny, to be honest, but still…HA! Serves you right for being cocky. The game is not as tight as I would like it to be. While I don’t mind the digital timer, I think the game would have been better served with an Action and Turn track that provided players the ability to spend so many Action Points to do so many things on their turn. At risk of sounding like a game designer (which I am most certainly not), giving the player’s the ability to spend 1 Action Point per movement, 2 Action Points per landing, and 3 Action Points per battle would have helped keep track of what a player could or could not do on their turn . Then a Turn tracker could be used to keep the game counting down until it ended. None of this “real-time” nonsense that artificially caps a player’s ability to make meaningful decisions and play the game in a way that feels satisfying. More times than not, the digital timer got in the way of the game’s experience rather than enhancing it. Not a good thing. Overall, I was entertained more times than not, but I am of the opinion that this game still needs some work. Presentation and game play has yet to rise to the game’s narrative. The theme is a good one and there are many game elements that are worth smiling about. It just comes across as unrefined and that leaves players feeling a bit hesitant to invest themselves in something that doesn’t look or feel done. For those who play it, the search for the Grail promises to be an interesting one, full of danger and exploration. Tagged Real-Time Games, Science Fiction Games, Space Exploration Games. Bookmark the permalink. Thank you for the detailed and honest review Cyrus! I greatly appreciate it! I wanted to let you know a few things. In the latest version of the game Extraterrestrial Grail, the Attribute cards now have description text on them so the players won’t need to constantly look at the rule book. Also, the instruction cards now have pictures too. Most of the font and art in the game has been updated as well. If desired, people who play this game can vary the initial time set on the timer so that the tension and feeling of being rushed is diminished. You could set the timer for 45 minutes or even 60 minutes for example. The idea of using a turn track is interesting, the players could even keep track on the notepad if they wanted to go that route. This could be a useful variant of the game for some players.